Inspiring photo… So uplifting. Can't help but smile. Yes! This is what I felt like during the blizzard…a little kid. I enjoyed playing in it! She is gonna bite it… wish we had a photo of the "landing." Fantastic photo – hope you're enjoying the snow! It's great to see a redhead, her hair flying in the wind, enjoying the snow….like we do in Chicago. We jump like this constantly. It's in our DNA. What a happy picture!! !…and how i miss new york and snow!! !…kisses from italy!!! Fairy tales can come true.. Perfect ending to this year…someone carefree and having fun. I love her rosy cheeks! And I guess it's not that cold over there since she has her coat open – or then all that jumping in the snow has warmed her up! Everyone should try that (and long merino wool/silk underwear) – embracing the wonderful winter instead of complaining about it and missing all the fun! She really has the right attitude and boots to match it. Such a great picture! So much snow… Where is she jumping from? It's beautiful to see someone enjoy life so much! I love the colour of her jeans… I want a pair exactly that colour! And her hair is simply stunning! What a wonderful moment for her, to be captured forever in flight and in time like that — beautiful, joyful and free as a bird. And what a wonderful memory for you, the lucky photographer. Big snowstorms often make people sooo cranky. It's nice to see someone actually enjoying the snow instead of complaining about its inconvenience. This shot captures sheer joy–something we all need in greater abundance. Free fall in the NY snow…waaau! Great photo, actually makes all the snow… fun! Love this pic! She reminds me of Kate Winslet's Clementine in Eternal Sunshine of a Spotless Mind — another great free spirit. 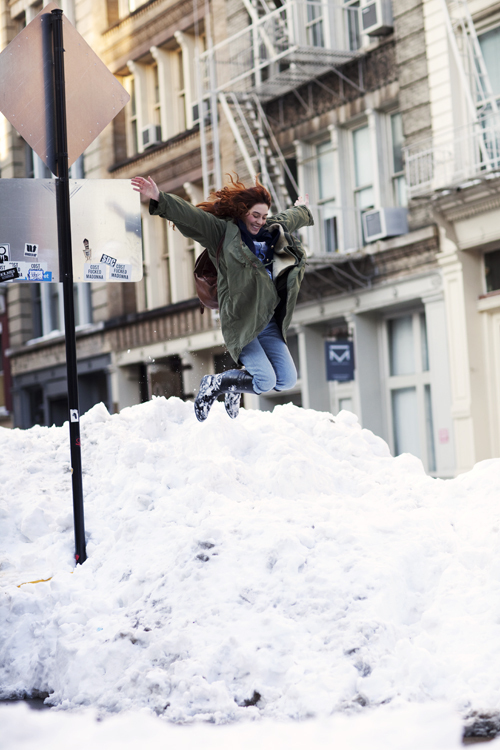 a happy, stylish red head and a snowy new york – this made my day. happy new years! Wonderful picture! Who cares what she is wearing – she's having fun! pure, unadulterated fun. beautiful! we need more of it! ICONIC. This will be one of THE images for years to come! Love this image! Exactly the way I feel as an Aussie having their first white Christmas! it's interesting to see how this whole snowstorm in nyc means trouble for some and joy for some others. lovey shot! I love her hair!!! what a shot to welcome 2011 ! well, it´s always about timing, isn´t it ? This is a great shot! Her hair looks so fiery. I hope she made it down ok! Beautiful pic, but am I the only one who sees this and thinks "The ground is probably icy. This can end badly."? Love….Winter Spirit! Happy New Year! I live in Canada, and all our 1 cm of snow just melted. I am envying this so much right now! You make me yearn for winter just so much more with this picture! I think we've all dreamed of doing this…but you got the shot!..Love it! now, that looks like fun…! Amazing. The snow, the jump, the hair, her boots, even the stop sign! This is such a fantastic picture! Happy New Year! Gosh, I love this photo. Gosh, I love New York. I look at your blog every day and this is by far my favorite! your amazing. Love this photo, it exudes happiness! hope u had a great start in to the new year. MISS snow– here in Miami! Happy new year. So funny pic! What a great shot after such an awful storm! She's having fun like a little kid done with school and look at those ups!! I just wanted to ask you want camera you use for your photos ! Happy new year ;) from Slovenia. follow eachother? i'm following you on bloglovin. and.. do you want free blog promotion? take a look at my blog at the tab; 'blog promotion'! I love the photo and the atmosphereCongratulations for your blog! gorgeous! amazing pic…as always! happy new year!! this picture is so joyful! I love it , really! Willie boots 101. The snow just brings something out of everyone. I love her hair!!! HNY Scott. Where are you? I miss your photos. You and Garance = one of my addictions. Not since 'BIG' has an adult had so much fun jumping over Soho. Here no matter the look! Nice pic!!! Amazing picture, I love her red hair. Love it! Such a happy shot! she has the most stunning hair!! These styles are really good. I love the shot of the lady jumping into the mound of snow. Looks fun! Ok. Now this one I get. Nice fun picture. Captures the moment of fun in the snow. I even like the military jacket with the wellies. Thank you for making sense again. I LOVE this photo! Beautiful hair and smile! Love your photos! You're a great photographer! Just in case someone hasn't sais it – Joie de vivre! I believe a CAN fly…. By the Scott, where is your lovely bird Garance????? Wish you two, a light and smooth year 2011…. What a great shot.. fantastic! Yay REDHEADS!!!! She is adorable. Love seeing people happy in the snow! Now THIS is the hottest pic in snow young man! You are simply… the best!! Oh, so cool, that must have had been one happy day! So cool, great picture! This is amazing! Wow! Love the shot. love this picture at all! As a redhead, I love her hair. She looks so joyous, and like she is welcoming winter with open arms. What a joyous picture! I love the spirit of this and the snow is still white. Awesome! This the epitome of fun in the snow. what a moment you captured. i live in new york but have been away for the holidays…kind of wish i was there to experience this winter wonderland! THis is one of my all time favorite images from your blog. It captures almost everything good about a snowy day. Wow, what a great photo! A Happy New Year to you! It looks like "Eternal Sunshine of the Spotless Mind"! Love that movie, love the matching feel of this special shot. look at her face…pure happiness! Aw, I totally wanna go snowdrift-jumping with her! So fun! Fantastic photo! So much fun! where will she land? It probably doesn't matter, she is obviously all about being bold and sometimes that means taking chances. Love this shot, she is just enjoying herself. Shows how much fun there is to be had on the streets. Hope we do work for the future of photgraphy ! What an incredible hair colour! This picture has to be one of my faves. this is so cool, what settings did you use to make this photo? I just LOVE this one. I really admire your work and all those beautiful faces you shoot. Great photo, made me happy. I sat on Broome St, drawing, last June. It´s so beautiful to see it covered in piles of snow. This blog is amazing! I love the way you take the photos! It's au naturelle which is the best way to do it! Looks like fun. I want to be there too! I just finished watching Eternal Sunshine of the Spotless Mind 15 minutes ago, and now I stumble over this, I love it! Yup, that is just what it was like in NYC. What a great catch — the girl in flight jumping off the snow drift. This pic's outstanding – the winter version of your americana girl running through the water at wash square park. bravo! I always love the New York shots. the fire red of her hair against the snow. amazing. and I really love your work! thanks for your work that change my feeling ! Wow, the sharpness and vibrancy of this particular shot is just simply wow. It screams that feeling of, "You have to look at this!" and it does superb. This is a fantabulous photograph! I really love your blog and your picture : you can catch the most beautiful of every single person. I'll be following it carefully. love the redhair !! Fire on Ice! Good work – an amazing shot! very very cute, she's nice. Love your work. Very nice and perfect timed shot!